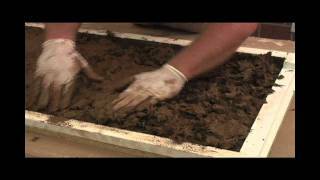 Stamping is one of the techniques that makes concrete so versatile, allowing it to look like tile, brick, cobblestone, and more. The how-to-video covers every step of the stamping process, giving you all the information you need to create your own stamped look. 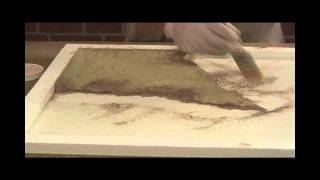 With the right technique, concrete can look like almost anything, including wood. 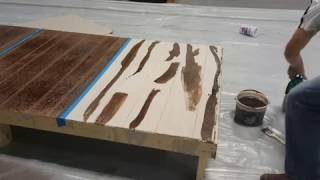 This easy-to-follow tutorial gives you step-by-step instructions to create your own “wood look” concrete in a single day. Epoxy flake flooring offers a slip-resistant grip, perfect for high traffic areas on pool decks and patios, in commercial workspaces, and garages. 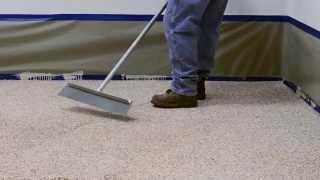 Watch this helpful how-to video to discover how to install your own epoxy flake floor system. Travertine and veining creates a stately, natural look that conjures up images of Roman architecture and great ancient palaces. 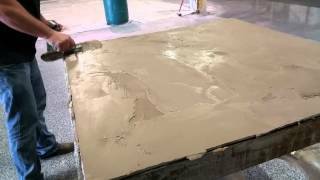 This tutorial shows how you can use simple baking soda to create a stunning travertine and veining concrete countertop or wall panel. Sandstone is a popular look texture in the kitchens bathrooms, adding classic strength and grandeur. This texture works perfectly for uses for concrete countertops, thin concrete wall panels, fireplaces, and many other precast pieces. Watch this tutorial to learn how to create this look for yourself. Take old concrete and make it like new with a burnished look. 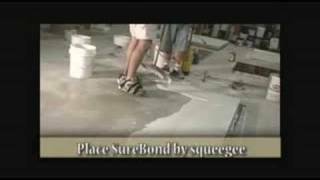 Using only a micro topping, a simple trowel, and a spray bottle of water, Surecrete shows you how to update pre-existing concrete.